So here I am (left) some 32 years ago with my first Star Wars Christmas toys…and here are the boys (right) last weekend with some true to life Star Wars personalities. 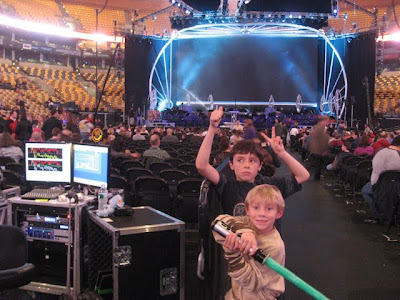 So about a month ago (when Gail was not home) I splurged for some tickets to “Star Wars in Concert” for this past Saturday. 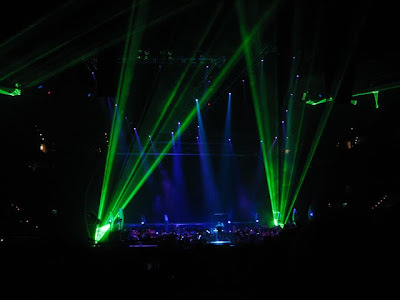 I was editing images when I heard the music on TV advertising the concert that was coming. I was giddy thinking about bringing the boys there. 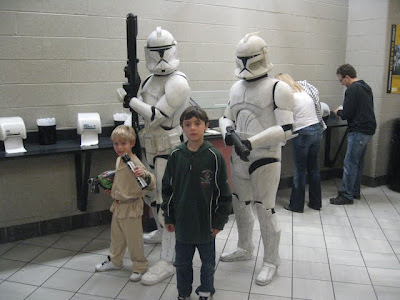 After the newer star wars movies came out, my boys were NUTS about it. Light Sabers and Star Wars costumes from Nana took over our house. 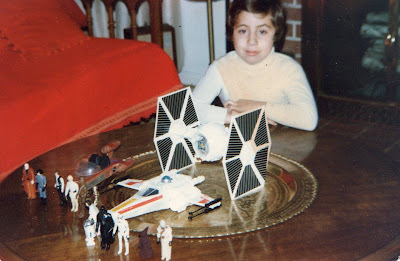 Boy were amazed when I pulled out my 1977 Land Speeder and some of the original figures. They sure did not stack up to the newer figures! 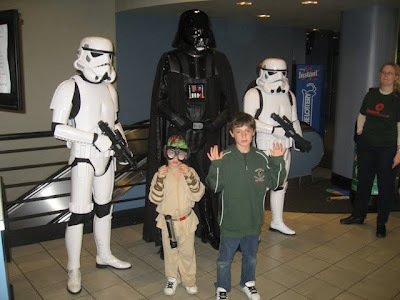 So when we got into the Garden about 1-1/2 hours before the show started, the halls surrounding the garden were filled with Star Wars original exhibits as well as club fanatics with some of the best costumes I have ever seen in person. 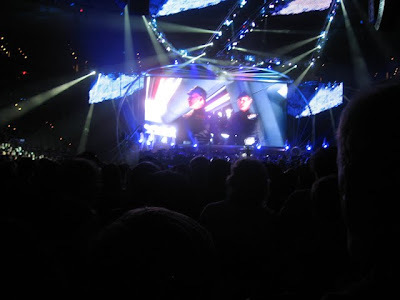 When we went to sneak down the elevator to the floor level for our seats, a hole group of them came in with us! 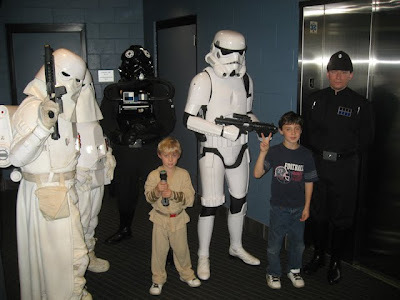 (left) I really felt like we were taking a ride in the Death Star elevator being brought to Darth Vader himself. The boys LOVED the show as did we. It was very well done. 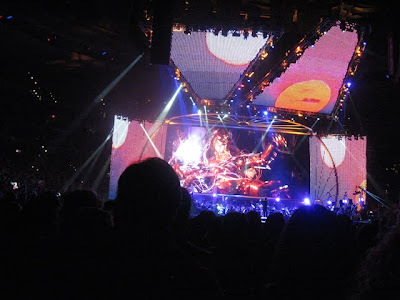 Live orchestra, choir, top notch lighting, smoke machines, pyrotechnics, lasers and the world’s largest traveling true HD screen….29 feet high by 60 feet wide! The picture was unbelievable. Sir Anthony Daniels (the man behind C3PO) narrated the show and would introduce each video montage that told the story of the all 6 Star Wars movies. Definitely took me back! I watched Star Wars for the first time with my sister on the on the roof of my fathers Nova in a sleeping bags at the Drive-in move theater. Now here I am 38 years old married with two boys who are running around the same house I did with cooler Star Wars toys than I ever had! 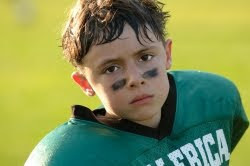 So Sunday brought the end of another Pop Warner football season. 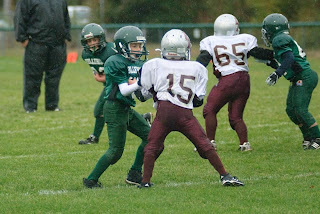 Both Matthew and Steven had thier last games of the 2009 season. 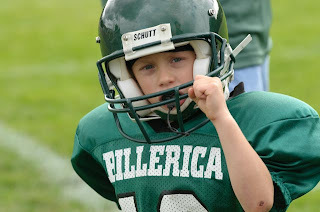 As we did last year Gail and I photographed all the kids in action at almost all the games. 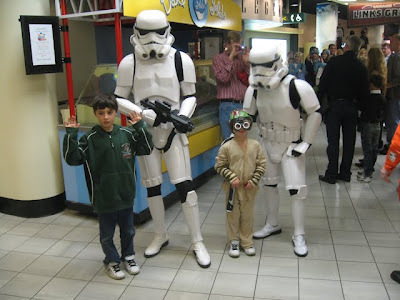 We posted the images online and for $2.50/ea, parents could download and own whatever photo they wanted. All the proceeds are going toward the end of the year festivities for their teams. We shot and edited through about 9000 frames of their games this year and posted around 2000-2500 of them. We have a great time capturing the all the kids in action and the parents are always very appreciative. I helped coach Stevens team this year as I had the last 2 for Matthew. 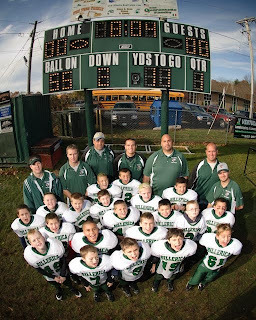 I have to say after spending two years helping to coach the kids on Matthew's team, I missed them this year. However, all the new faces on Steven's team kept me more than busy! "Stay in line! ", "Keep your hands to yourself!" "Stop ripping up the grass!" Amazing to think that’s where they all were mentally not two years ago. They have come a long way! 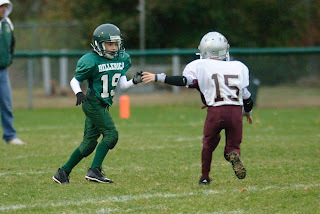 As CRAZY as the schedule always gets, we love that this sport helps brings us all together with the kids and freinds at the field. They boys stay in shape, get stronger and the team ethics our doing a great job carving out our little men. And now....well... now we get back about 20 hours a week...YIPEE! We will miss our family at the field though. Matthew’s team,the Lil’ Indians, went UNDEFEATED! Eight wins and zero losses. 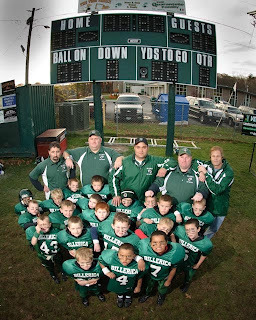 I am not sure how many times that has happened before in his league, but I would bet they had the best record in all Billerica Pop Warner…quite possibly the state! 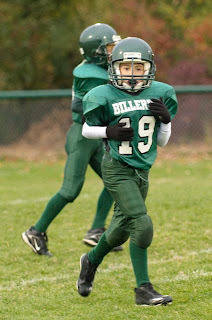 Steven’s first years with Pop Warner was great! Definetly getting my Rookie of the Year vote. 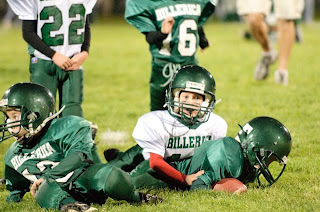 He had at least several QB sacs to his credit and a fumble recovery/return. 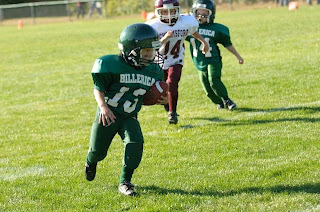 Not bad for our little defensive lineman.